JEE Main Marks Vs Ranks: JEE Main Marks Vs Ranks will give you a clear idea regarding your expected rank with respect to the marks which you have scored. NTA is conducting the JEE Main exam (1st attempt) from January 8th to 12th January 2019. JEE Main Paper 1 for April session will be conducted on 8th,9th,10th and 12th April 2019 and paper 2 will be conducted on 07th April 2019. The JEE Main Marks Vs Ranks are announced by the Joint Admission Board every year after the JEE Main results. Ranks are calculated on the basis of the scores obtained by the students in the exam. Students should know that the JEE Main Marks Vs Ranks do not differ on the basis of categories. The All India Ranks will be released without considering the categories. Categories will be considered during the counselling procedure. The JEE Main Marks Vs Ranks will help the students get an idea of where to seek admission during the JEE Main counselling process. If one clears the JEE Main cut off with their JEE Main Marks Vs Ranks, they can seek admission in the National Institutes of Technology (NITs), Indian Institute of Technology (IIITs) and Government Funded Technical Institutes (GFTIs). They will also know if they are eligible to appear for the JEE Advanced. 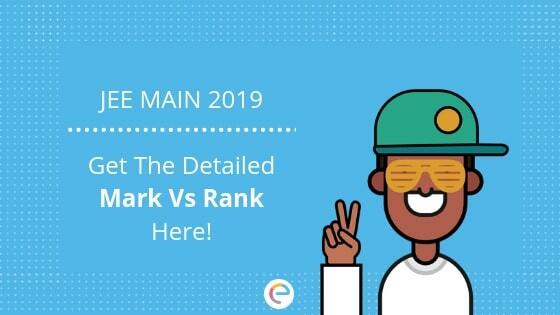 As the Marks vs Ranks for 2019 is not yet released this article will provide you with the information regarding JEE Main Marks Vs Ranks of 2018. Read and find out. JEE Main April Exam is around the corner! Are you worried about the JEE Main 2019 paper? We have your back! India’s best data scientists have analyzed the JEE Main papers of the last 22 years on various parameters like the difficulty level, syllabus coverage, ideal time for each question, questions involved with multiple concepts, repetitive nature of concepts, etc. Keeping these parameters in mind, they have generated the JEE Main Predicted Question Paper that is verified by the senior academic experts from across the country. Embibe’s JEE Main January Predicted Question Paper is India’s first and only predicted test powered by AI and data science, having 95% chapter similarity to the actual JEE Main January question paper. Besides taking the JEE Main predicted question paper for April session, practicing the JEE Main January session question papers is of utmost importance to the students. Moreover, solving the JEE Main previous year papers will help them improve their conceptual knowledge and test-taking skills. Tabulated below are all the 8 papers of the JEE Main 2019 January session for you to solve as you prep for JEE Main April session. JEE Main 2019 is going to be conducted by National Testing Agency and the JEE Main Marks Vs Ranks will be released as soon as the JEE Main results are out. Enter your Roll No. & Date of Birth. The Rank List will be displayed on the screen. Check your rank and save it for further use. The National Institutes of Technology (NITs) are autonomous, public institutes of higher education. They are governed by the National Institutes of Technology Act, 2007, which declares them as institutions of national importance alongside the IITs. There are 31 NITs across India and each one is funded by the Government of India. These institutes are among the top-ranked engineering colleges in India and have one of the lowest acceptance rates for engineering institutes, of around 2 to 3 %, second only to the Indian Institutes of Technology (IITs) in India. The link below will provide you with the JEE Main Marks Vs Ranks for NITs. Indian Institutes of Information Technology (IIITs) are a group of institutes of higher education in India, focused on information technology. There are presently 23 IIITs, out of which 5 are established, funded and administered by the Ministry of Human Resource Development (MHRD). The rest are set up on the public-private partnership (PPP) model. The link below will provide you with the JEE Main Marks Vs Ranks for IIITs. Enriching the Indian technical education scenario are Government Funded Technical Institutes, commonly referred to as GFTIs. There are 18 GFTIs, each of which is expected to contribute its bit towards the greater cause, which is to create a technically literate society and keep India progressive. One element central to these technical institutes is their status as participating entities of JEE Main. Constituted by The Central Seat Allocation Board, Joint Seat Allocation Authority handles the intake process of the Government Funded Technical Institutes, which is conducted in multiple rounds. The link below will provide you with the JEE Main Marks Vs Ranks for GFTIs. We hope this detailed article on JEE Main Marks Vs Ranks helps you in your preparation. If you have any query regarding JEE Main Marks Vs Ranks or the exam in general, drop a comment below and we will get back to you. Will this marks vs rank be approximately correct? I’m getting 150 marks in jee main 2018. What rank can I expect?? If i got 90 marks, what will be my General rank and OBC rank? Hey, we will upload it soon. when will you upload general rank vs st rank?? and is very accurate?? becuase last year the marks vs rank chart was VERYY different… and also because online was easier than offline this year….so will it change or stay like this only?? We will update it once the official figures are released. and u only given upto 100000? hey can you plz tell me how much marks should i get in jee mains if i want to go to nit nagpur if i am from sc category??? This changes every year based on multiple factors. Also, it varies from branch to branch. In order to guarantee admission, you should plan to score as high as possible. Hi Raju, It seems you can get into NIT. But however, you should appear for JEE advance and meet the cutoff as specified by the officials. For the upcoming JEE Main in April, you will have put in more efforts in the right direction to qualify for JEE advanced as your score in JEE Main Jan session will not be enough. This is the time when you can focus on your conceptual knowledge and practice. Take JEE Main Mock Tests to test your present level of preparation and work on your weaker zones and mistakes. Embibe provides you all you need for JEE Main preparation so, fasten your belts and spend your time in studying, practicing and taking tests. Also, focus on other parameters such as time management and question selection.